Ah, but oh so decorative! You are brave, good luck! There are cycles for everything and you definitely sound “pumped” up, Julie. This post really “spoke” about that! Thank you for giving me so many pun opportunities this morning! If only he didn’t poop it would be fine! I suppose I could squish him in the basket? HE has made himself determined too! 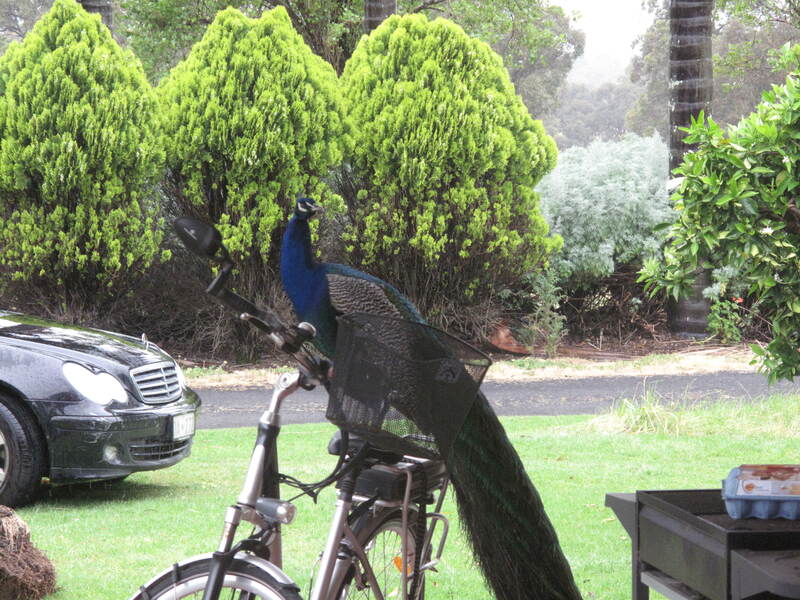 You might have to get an extra bike so the peacock can ride alongside. The bike is like magic! I’m getting better at timing the safe times to ride. I will have to shoo him off this new favourite spot of his! Put it in the basket and just pedal off. I will have to wait until he sheds his feathers! Best hood ornament I’ve seen yet! Glad you’re riding, and hope you are correct about the route being truck free! I have the same problem here! But at least you don’t have this fellow, and yes, he lives in our neck of the woods! He is a truly scary man. Someone wants to go for a ride! Well he is going to be disappointed! I guess he wants to see the countryside as well? Glad you are determined to get back on your bike. I am determined to get more exercise. Until the morning and I decide I’ve got other things I’d rather do. Ah yes, you sound like me! Now that’s a bike ride that would get a lot of attention. He is such a funny bird – does twirlies when I come out of the house! My motivation keeps ebbing – argh!